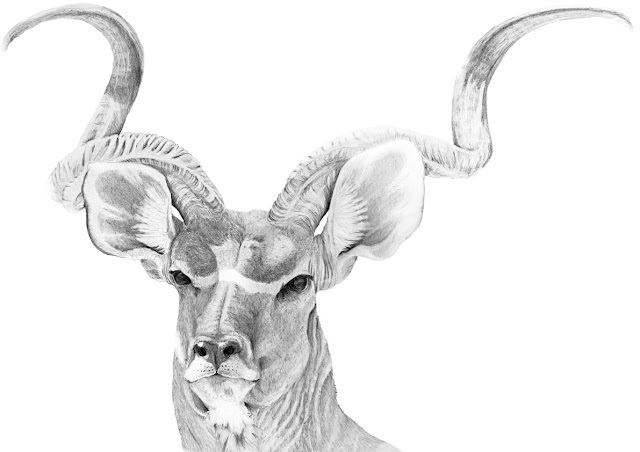 The greater kudu (Tragelaphus strepsiceros) is found in the southern area of the African continent, usually residing in wooded areas and bushlands. They are a large antelope, and both the males and females have stripes and spots on their body, which allow them to blend into the surroundings if standing still. The females are noticeably smaller than the males, and gestation is up to 9 months. Life span is generally expected to be 7 or 8 years, although they can survive more than 20 years when in captivity. Only the males possess the long spiral horns (depicted here), which can grow to around 72 inches long, and make a few spiral turns.